The Knochel lab is reporting air-stable organozinc compounds for Negishi coupling reactions (DOI). Here are the details. Key is the transmetallation of an organomagnesium compound with a zinc salt. The Grignard reagent is prepared via a turbo Grignard. The success of the Mg - Zn transmetallation is found to depend on the nature of the zinc counter ion. A pivaloyl ion is effective because zinc is coordinated to the two oxygen atoms. The organozinc compound is air-stable for up to 4 hours and can even be used with technical-grade THF. in THF. For the remainder of the reaction its presence is a nuisance due to its hydrophilicity. Tomasz Kruczynski et al. have news to report on the Grignard reaction and more specifically the SET mechanism believed to be responsible for the formation of the Grignard reagent (DOI). As a quick reminder, in SET the organohalide R-X reacts with magnesium metal to form the organic radical (R.) and Mg.+X-. 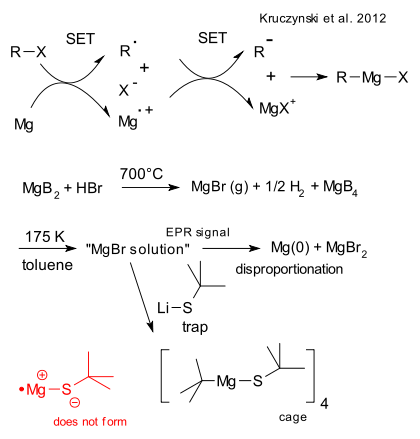 In a second SET step the organic group gains an electron opening the way for formation of R-Mg-X as the Grignard reagent. The isolation of obscure MgBr as opposed to common MgBr2 would then be a nice addition to Grignard know-how and this is what the Kruczynski team set out to accomplish. "redox reaction has occurred in which the tBu+ unit in the StBu- moiety is reduced to tBu-, which then is directly connected to the oxidized Mg2+ cation; that is, the SR anion could react like the isoelectronic RCl species in a Grignard-like formation reaction with elemental magnesium". Some last minute changes to the chemical reaction database. We really do need to store the CML file. On the other hand, we can skip to chemical formula as it is already included in the InChi. No need to duplicate information. Can we handle patents? Patent information is notoriously difficult to find. There are plenty of websites that offer basic patent information (what is the business model?) but only a few offer the full document. The is no patent DOI equivalent. So we are forced to store the full url to a resource as well. The example below describes a single carbon atom extraction. Firefox required!